3. Sift (for easy mixing) in about 1/3 of the cake mix and stir until combined. 5. Add another third of the cake mix (again, sifting for easy stirring). 7. 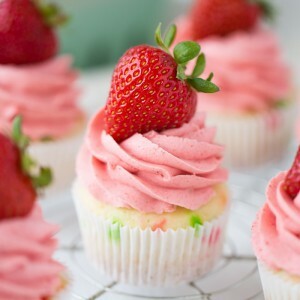 Fill cupcake liners ¾ full and bake for 18-22 minutes or until an inserted knife comes out clean. 8. 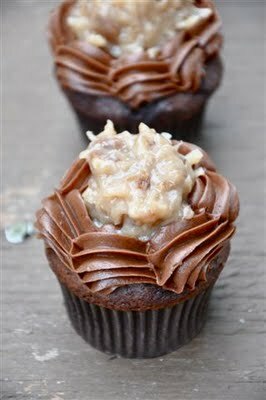 German Chocolate Frosting: On medium heat in a sauce pan, constantly stir evaporated milk, sugar, egg yolks and butter until thickened. (Basically, until it boils and it will take approximately 15 minutes.) Stir in vanilla extract, pecans and coconut. Let cool. 9. Chocolate Buttercream: Beat cream cheese and butter for 4 minutes. Add cocoa, powdered sugar and vanilla extract. Let beat for 3 minutes. If it is too thick, add milk. If it is too thin, add powdered sugar. Or if it is not dark enough, add more cocoa. 10. Pipe Chocolate Buttercream around the edge of the cupcakes tocreate a barrier, and scoop a small amount of cooled German Chocolate Frosting into the center. I asbolutely love your cupcakes, I think they are always so beautifully decorated! I remember reading one of your posts about a wedding that you made cupcakes for…my good friends have asked me to do the same and while I'm completely honored, I'm so nervous about it! Any tips for me?! Plan ahead. When I made cupcakes for my best friends wedding I was able to made my decorations ahead of time. Also do not!!! decorate until you get there. I would have been a nervous wreck if I had been trying to transport 300 frosted cupcakes. Another thing, bring a helper but be very clear about what you need/want them to do. I piped all the cupcakes and she added the decorations, sprinkles and drizzle. (but not until I had showed her exactly how I wanted it). Over prepare, what a bummer it would be if you didn’t have enough frosting. How dedicated, making 100 cupcakes for his birthday! I guess we both have the same great tastes in cupcakes-my pick would have been the german chocolate also. These look simply delicious. Thanks for sharing. 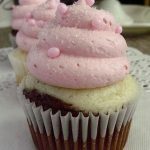 Such a pretty cupcake! My dad would go nuts over these! Hey my seven little kids went nuts after these. After making 8 pieces, they even want me to bake more! Especially my 4 year old son,he keeps on shouting "Hey mom I want more! Please!" I tasted it, and wow it's really yummy.! Oh my goodness!!!!!!!!! Looks like a new favorite of mine! Beautiful! yum, yum, yum! made these over the weekend. sooooo good. german chocolate is my hubby's fav! can these be frozen? or just the cupcake frozen and frosted later? can the frosting be frozen? I'm curious. I'll be making 100 cupcakes for a teacher luncheon. Did you make in batches or mix dough in double or triple batches? Did you rotate your baking tins? Inquiring minds want to know how to pull this off. I'm thinking I will need to make the cupcakes this weekend, freeze them, then frost them the night before the event. Any thoughts on that? I always bake the day of an event, even if it's 300 for a wedding. For this event, I made double batches and I usually have 4 pans, two in the oven at a time. 100 cupcakes really is not too stressful, you will do great! Email if you have more questions! Hi Lizzy, found your blog through Pinterest. I know the feeling of baking for large groups. I make almost 100 cupcakes for my daughter's bridal shower last spring. It's too fun and the joy of seeing everyone eating the cupcakes and smiling, is the best! I just made these last night and they were a hug hit!!! I love baking all your cupcakes!! I was wondering where do you buy you cupcake liners? Mine always look greasy and lose color.. I usually use white (because they are cheeper), but when I want to get fancy I will get some off Etsy.com, Amazon, or head out to Michaels or another decorating store. There are grease proof liners you can look for, more expensive, but they look very professional. I made these for an Oktoberfest type dinner last Saturday night. They were just wonderful and got great reviews! Thank you so much for sharing your recipes! Those are so beautiful. What tip did you use for the Chocolate Buttercream? Thank you! I made these and am so happy I tried this recipe. They are amazing! how would you be able to make vanila frosting?i'm not that much of a sweet tooth. Just omit the cocoa powder and add a little extra powdered sugar to keep the frosting thick enough. Good luck! Found this after searching for best German Chocolate cakes. My sweetheart has loved this as his birthday cake for many many years. On his 51st, he said this was THE BEST homemade German Chocolate cake he’s ever eaten–Thank You! Next time I’m going for the cupcake style since they look soooo perfect and I know the taste is beyond amazing! I am so glad he loved it! Oh gosh! Thank you for posting this! I unwittingly started a tradition of making homemade German Chocolate cakes for people on their last days of work, but I hated watching people being so messy cutting a layer cake. I just couldn’t figure out a way to include the classic frosting, but present it in a cupcake. But this is FANTASTIC! It looks as elegant as the full sized cake! You’re an inspiration. I plan on using the recipe straight off the German chocolate bar, but I’ll be using that chocolate buttercream one from you! Hello! I am actually making these beautiful creations as I type! I was wondering if you could tell me what you scooped your frosting with… I was thinking of using a cookie scooper… but I’m afraid that will be too big and I’m sure I will mess up the barrier… do you think those of us who are less professional should scoop first… then do the chocolate frosting? Hope to hear back soon… thanks! Pipe the barrier, then use a spoon to place the coconut pecan frosting in the center. You won’t get a perfect round top, but it will keep you from making a mess. I used a mini cookie scoop. hi lizzy, i wana try to cut this recipe in half coz it makes too much cupcakes. so should i use 1/2 box of the devils food cake mix???? I made these for a co worker’s birthday. They all accused me of buying them and putting them in my own container and pretending I made them. lol. They were soooo awesome. Love the chocolate frosting. Hey! These look AMAZING! 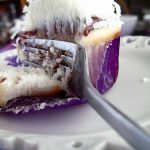 I am going to make some in a couple of weeks and was wondering what decorating tip you used to pipe the chocolate frosting on the cupcakes with. Thanks! The tip says… Magic tip 2C on it. It is a medium sized closed star tip. I tried these today for one of my husband’s co-worker’s birthday and they turned out awesome! So cute and very delicious! Do you recall what tip you used to pipe the frosting? I would like to copy these for a German festival coming up. The tip says magic 2C. It is a medium size closed star tip with about 10 prongs. Just find something similar and it will look fabulous. I made these for my Daddy for Father’s Day and they were AMAZING! I used a German Chocolate Cake mix instead and spruced it up, but the frosting was to die for. I made these cupcakes yesterday, and I have to say these are the best cupcakes I’ve ever had in my life! The batter was like chocolate pudding lol, and the frosting was so amazing people said if I gave them a bowl of just the icing they would be happy. =D Amazing recipe! 5 Stars! I made 6 dozen of these for an office birthday party, and they were a huge hit. 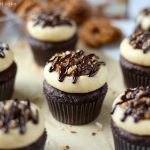 Before finding this recipe, I was unsure how to translate a normal German Chocolate recipe into cupcakes without covering all of my coworkers in Butter Pecan Frosting. The Chocolate Buttercream served as a delicous barrier to keep all of gooey goodness in place. This recipe is totally worth the extra work. I was told by more than one person that it was the best German Chocolate cake they had ever tasted. 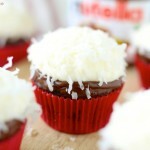 Thanks for sharing, I now have one more staple recipe in my cupcake repertoire! 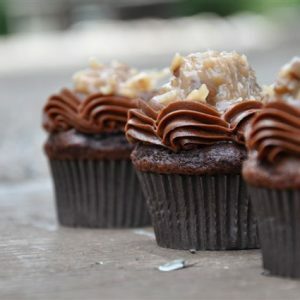 Made these today, but instead of piping buttercream frosting around the edge, I just traditionally frosted them with the German Chocolate frosting (and I had extra to boot!). They were delicious! The cupcake recipe was great because they came out of the oven looking perfectly round and tasted moist and fluffy. I was wondering if I could use the German chocolate cake mix instead of the devils food? Wow! They look so beautyful!!! My Dad’s 65 birthday is this weekend. I asked him if he would like me to make him some German Chocolate cupcakes, he said YES. He loves German Chocolate. I can’t wait to make these for him. I made these for my husband’s birthday. They were beautiful, and absolutely wonderful. I’ll definitely be making these again. Thanks for sharing. I have watched ur website for over a year now. Last night I finally baked my first batch of ur cupcakes. Omg! Absolutely delicious! 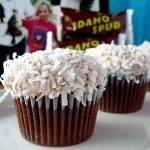 I’m on a search for my wedding cupcakes, and I found my first winning recipe. Thank u! I would make the German chocolate cupcakes first. Then I wouldn’t be able to decide what to do next! I am so glad I found your website. Thanks so much! I was just curious, i love the cupcakes, but want to make it in an actual cake version, any degree differences? cook time differences? But these were the best Thanks!!!!! Hey Lizzie, Do you have a recipe for your Strawberry Lemonade cupcakes that you mention in the story? I couldn’t find them on here sorry! Thanks heaps!! 🙂 can’t wait to try! 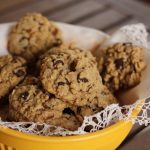 Not going to lie, I get very excited when I see that you have posted a new recipe! You have a wonderful site and I can’t wait to try some of your recipes. All of them look simply delicious Thank you for sharing with everyone. I found you via Pinterest. Happy you found me!!! Love Pinterest! Can you use the same recipe and make it into a two-layer cake? I made these last year for my mom’s birthday as cupcakes and I’m thinking this year we’ll go for a cake. She LOVED it – it tastes amazing! This recipe is delicious and I just pinned it to Pinterest. The batter is moist and fluffy. I loved the buttercream. And the topping is rich and delicious; I toasted the coconut and pecans as well. Thank you for this excellent recipe! Thank you for this amazing recipe. I made them for my boyfriend for Valentine’s Day and he loved them. Now I am making them for my friend’s birthday. The cake turns out so moist and fluffy. The buttercream is delicious and the topping is perfect. The new 15 oz boxes are totally fine! lizzy. You cupcake looks very good. I would love to make these cupcakes for my daughter graduation party. I have a question and Please I hope you can answer it. Can I keep the cupcakes with the chocolate buttercream frosting at the room temperature? I am always concerned of making some frosting that has cream cheese because once I red Martha Stewart saying that the cupcakes should be kept in the refrigerated. For how long can I keep them outside a fridge? Thanks and you have great talent and I loved your site. All the best. Maria. I am aking these right now! Do these need to be refrigerated ? The frosting ingredients tell me yes? Well I hope it wasn’t the same without me! 🙂 So great to hear from you Emma! 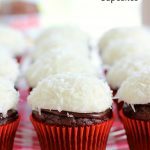 Can I make the german chocolate frosting without the coconut? My husband loves german chocolate cske but not the coconut. Yes, you may want to increase the nuts or decrease the liquid a little to make up for the lost coconut. Don’t want it to be too drippy! I just made these and they are amazing! Thank you so much for sharing this recipe – it was simple and delicious. My mom (who is a fantastic cook herself) said the coconut pecan filling is probably the best she’s ever tasted. And they’re so cute! 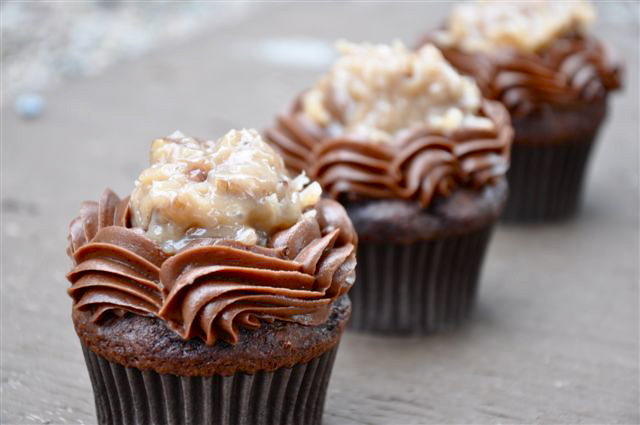 I made them for my new coworker who said German chocolate is her fave and I’m sure she will be impressed! Thanks again. I’ve never liked the store-bought Coconut Pecan frosting, but this homemade recipe was not only easy, but it was DELICIOUS. I had some leftover and ate it with a spoon. So fantastic, thanks for a delicious recipe! I loved it so much I made a variation and shared it on my blog, too! 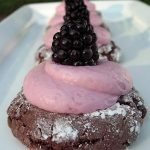 I just made these and they were wonderful! They look just like yours! 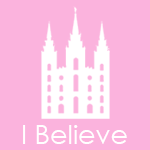 I just started to follow your blog and am so excited! You are amazing. Hi Lizzie! I made these a couple weeks ago with the new 15 oz boxes and got 22, do you think if I measured out a little extra to make it 18 oz I would get 24? Is that the size box you used when you originally did this recipe? Just want to be sure, I was requested to do 2 dozen for a bridal shower next weekend! Yeah, the new box mixes give you a few less cupcakes. You can just add a little extra dry cake mix or try using a “cake mix extender” people use those recipes to get a few extra cupcakes! Google it! This is my favorite chocolate cake recipe but the last two times I have made it, it has been super light. Very delicious but it sticks to the liner instead of coming off in the normal, pretty cupcake. I think I may be mixing the batter too much. What do you think? Have you changed the sort of cake mix you use? Maybe use a little less liquids in it next time! THESE WERE A HUGE HIT!!! SO FUN TO MAKE, AND OOOOOOOO SO DELISH!!! 😀 THANK YOU! Oh good! They are some of my favorites! 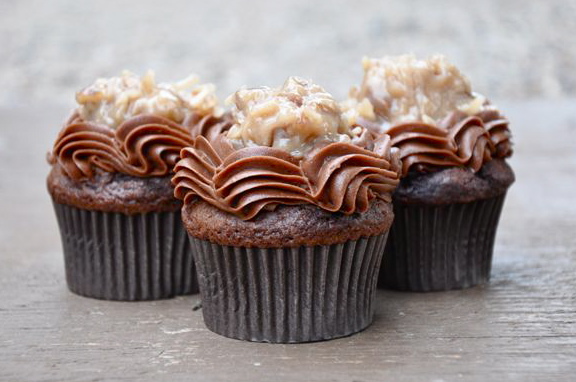 How long can you keep the german chocolate frosting? Keep it in the fridge for about 5 days, or you can freeze it for longer! I made these for my dads birthday and everyone LOVED them! Not only are they beautiful but they tasted wonderful! I LOVE your site and your books!! Thanks so much for sharing your creativity with us!! 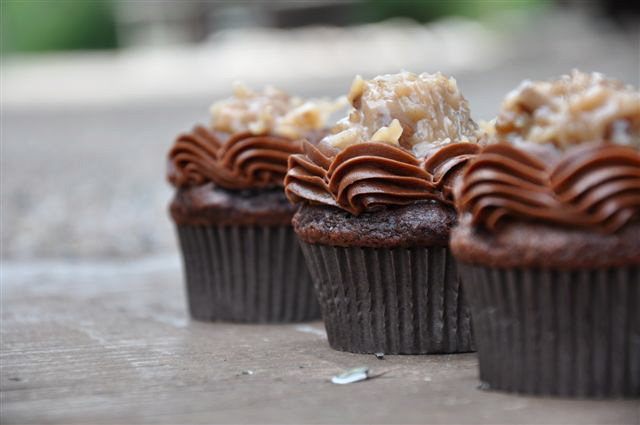 I made these German Chocolate cupcakes for my husband’s birthday yesterday, and took them to him at work. Everyone loved them! I did make one change to them. The coconut pecan frosting tastes great as written but I decided to add some bourbon to it (maybe about 1/2 cup) and that made it over-the-top amazing! Thank you for the recipe. I know this is a strange question since cake with frosting is pretty forbidden for someone with several heart disease and super-high cholesterol. I always used boxed cake mix, substituting applesauce for the oil, and notice no difference. 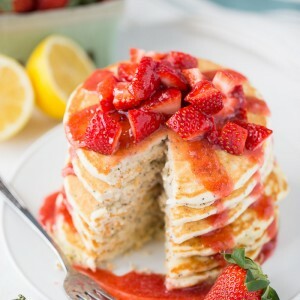 I’m wondering if I can use low-fat buttermilk and fat free sour cream in the cake, and fat free evaporated milk in the frosting? – saves SO many fat grams for someone who won’t stop with 1 or 2 cupcakes on his 60th BD. If not, how about just lower fat rather than fat-free products? Thanks! You can use regular milk instead as well, or yogurt in place of sour cream! It looks delicious. I’m going to try this recipe. I tried this recipe before from other blogs. The recipes are either dry or too sweet. Hopefully this one is perfect. Thanks for sharing! Does this pecan coconut frosting thicken upon standing? Or, did I not let it thicken enough? I let it boil for a few minutes before adding the coconut & pecans. It will also thicken in the fridge after you make it! for the box of cake mis do you dad the ingredientes in the box as well or just the others that follow ? I made these twice, both times my frosting was still so runny in the pan it never would have stayed on top of the cupcake & I had to add cornstarch to save it. I let it boil & stirred it constantly, what am I doing wrong?? Very frustrating, I’m experienced & follow the recipe yet it isn’t turning out at all how it looks in your picture. Oh I’m so sorry! Did you let it cool? I usually let mine cool in the fridge and then scoop it out onto my cupcakes! This recipe sounds sooo delicious. 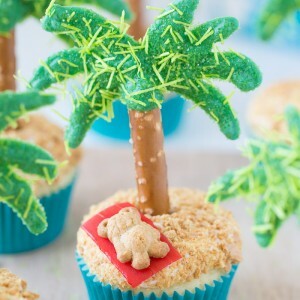 I need to make these for a party and they’ve requested mini cupcakes. 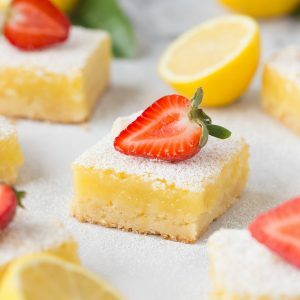 Do you think I could use this same recipe for mini versions? Should I keep the temperature of the oven the same and do you have any idea what the cooking time would be? Thanks in advance! So happy at last I got this recipe (German chocolate cake) will try one day, thanks . It looks tempting.